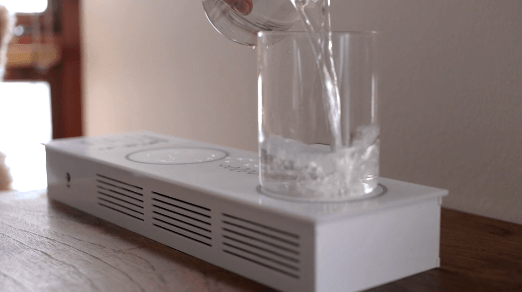 On today’s edition of “things techies are spending way too much time and money on,” we have a stereo you control by putting two glasses of water on top of it and pouring the water between the glasses. It’s called Pour Reception, and it combines amazing technology with a totally silly premise. According to a promotional video by artist Tore Knudsen (they created Pour Reception along with Simone Okholm and Victor Permild), the stereo “explores playful ways of interacting with technology that challenges our cultural perception of an interface.” Apparently, the cultural perception we’re challenging here is the one where we know not to dump water all over our music players. Here’s how the Pour Reception stereo works: You place two glasses of water on top of it and pour water into one glass to turn it on. Pour water from one glass into the other, and you’ll scroll through frequencies to find a new radio station. You can fine-tune the signal by touching one of the glasses, and you can turn the music down by dipping your finger into the water. Keep your finger in the water to pause the stereo. When you take your finger out, it’ll start playing again. Basically, this all works because Pour Reception uses the same interface as a touch screen, which conducts micro amounts of electricity and converts that into signals we can manipulate with touch. The stereo surface, the glass and the water itself all become part of this conductor, so certain signals interpreted by the arrangement of stereo, glass and water are translated into specific responses. Make sense?